Approach: If coming from Lake Louise, drive West on the Trans Canada (Hwy #1) for about 20 minutes to the signed Emerald Lake turnoff on the right just past the small town of Field. If coming from Golden, watch for the turnoff on the left just as Field comes into view. Follow the Emerald Lake Road for 8km to a parking lot at the end. The climb is visible from the parking lot, and it is highly recommended that you take a look during the daylight to scout the approach and see if the climb is fully formed. Ski around the North end of the lake on established cross country ski trails, then take your pick of routes. Either bushwack into the large avalanche path below and left of the route and ski up the potentially hazardous slopes to the base of the climb. Or, continue up the main valley across some flats at the back of the lake and pick you way onto the open avalanche slope leading up the valley. Continue up until you can traverse the slopes back left to the base of the climb. It may be easiest to go up via the second option and ski down more directly via the first option. Either way, expect to take about 3 hours to the base of the route. Route Description: A seldom climbed and challenging route with some awesome climbing, especially on the crux pitch. It doesn’t always form, and even when it looks fat it can have lots of rotten ice and very serious climbing, so be mentally prepared! The first 60m of ice is fairly low angled but can be very rotten and hard to protect. 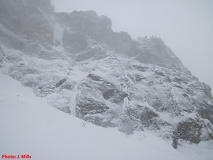 Continue up an 80m snow gully above, and find a belay wherever you can, likely on the rock. 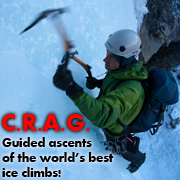 From here, either climb a pitch directly up thin ice if it is formed, or a rock corner on the right if not. The rock corner isn’t too steep, but is quite thin and balancy with not much for gear. If you climb the corner, then sketch your way back left to the ice below the upper pillar. A half pitch of shell ice over snow leads to a belay cave beside the pillar. There is an old bolt in the cave, but it will need to be backed up with an ice anchor. Now for the business, climb up some very technical and steep ice that gradually improves for 50 or 60 meters to the top. Descent: Rappel the route with V-threads and rock anchors. You may need to make 1 or 2 piton or nut anchors if the lower ice is too thin for threads. Gear: Lots of screws including stubbies, rock rock including pitons (mostly KB’s), and two ropes. Avalanche beacons, probes, and shovels highly recommended. Objective Hazards: Mega avalanche hazard! You can not avoid crossing numerous large avalanche paths on the approach. The route gets some sun, so rock fall and ice fall may be a concern at times.